Delivery Always Free with our Mobile Warehouse! Tired of running out of replacement bulbs or accidentaly buying the wrong ones? How about running out at the last minute and paying through the nose. Don't let your business be left in the dark! 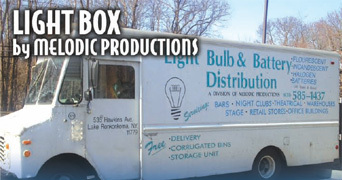 Let the pro's at LIGHT BOX take care of it for you! 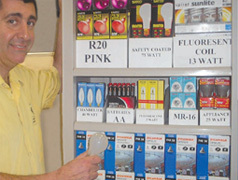 Our lighting expert will come to you and create a par inventory list, make energy saving suggestions, deliver and install an inventory storage unit to fit your specific space confinements, stock it with a 2 month supply of replacement lamps and batteries, plus set up independent, labeled storage bins to organize seperate items. Everything is free of charge including future bi-monthly deliverys. You just pay for the replacement bulbs and batteries (Consignment not available). To get started, or for more information, please contact us by filling out the form below, or give us a call at 631-467-7560.